The NGO "Youth-Info Montenegro" organized on Thursday 12th June, 2012 panel discussion "Ask yourself" in the hall of the Municipality Niksic. The panel discussion, was organized within the project "With activism to participation", supported by the Fund for Active Citizenship and attended with more than 30 high school students, college students, representatives of the youth activists of political parties, non-governmental organizations and the Red Cross reps. 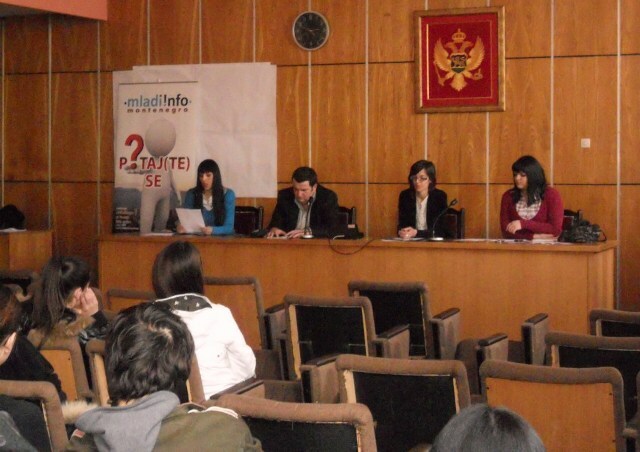 The NGO “Youth-Info Montenegro” organized on Thursday 12th June, 2012 panel discussion “Ask yourself” in the hall of the Municipality Niksic. The panel discussion, was organized within the project “With activism to participation”, supported by the Fund for Active Citizenship and attended with more than 30 high school students, college students, representatives of the youth activists of political parties, non-governmental organizations and the Red Cross reps.
President of the NGO “Youth- Info Montenegro” Milica Zugic said that the aim of discussion was to address youth that they should raise their voice in decision-making, but on the other side, the local governments also have to consult youth and ask for their opinion. Mrs Zugic add that with the project ” With activism to participation ” they want to launch the Youth Council as a representative body of all youth in Niksic, with a mission to make influence to the local government, to deal with youth policy and points to the problems that young people have in Niksic. On behalf of fAKT Anto Jankovic pointed out that Fund for Active Citizenship supports not only NGOs but also informal groups, and that this project of the NGO “Youth-Info Montenegro” is supported through Youth initiatives support program, financed by the Balkan Trust for Democracy (BTD) in Belgrade, and realized in cooperation with the Directorate for Youth and Sport. Mr. Jankovic stressed that the aim of the program was to support the implementation of local youth action plans in nine municipalities. Within this program, four projects are supported in Niksic.